Why am I writing Visme Review for the second time? Infographics, Graphic images are the most attractive and traffic driving content nowadays in Social Media. The businesses that invest more in their graphics tend to drive traffic from Social Media. The rest of the websites still have a tough time for organic reach at Social Media. There are so many graphic design tools available online. But, for creating Infographics I always love to go with Visme, because of the huge number of premade templates available there. 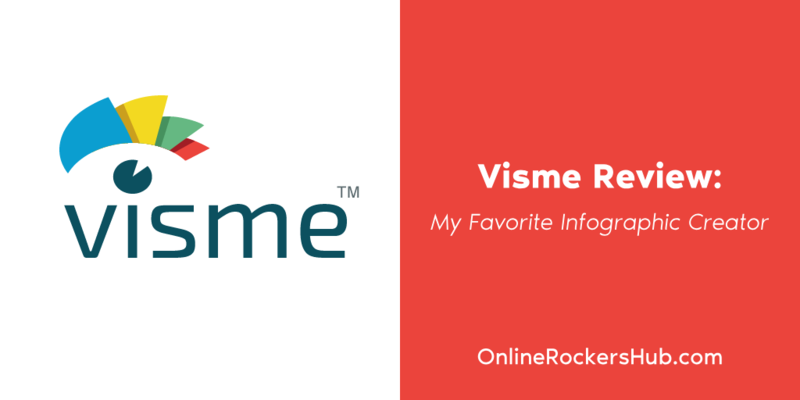 Let’s see more about the features of Visme in this Visme Review. Note: This is a sponsored Post. I received 6 months of Premium membership of Visme for this review. However, the content of this review is completely based on my opinion. If you have a product/service to be reviewed, then check my advertising options. As I mentioned earlier, this is the second time I am reviewing Visme. The reason is that it has been around 2 years since I published the last Visme review. Since then, Visme has been evolved with so many changes. How to get started with Visme? Visme is an online graphic designer that allows you to create Infographics, Presentations, charts, reports, Web and Social Graphics. They stand out with their stunning visual formats. So, why should you try Visme? If you have been using any online graphic designers and looking for an alternative with user-friendly features, then I would recommend you to try Visme. And you can publish and share your visual content in just one click. 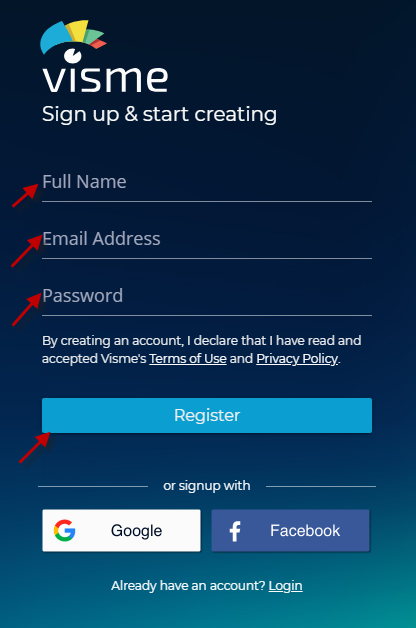 To get started with Visme, you need to create an account at Visme. Now, you will have to fill up the Visme Signup Form. You can either create a manual registration or use your Google or Facebook account to create a new one. In the next screen, you are asked to enter a few details about your profession. You just need to enter your Role, what type of organization you work at and then what you are looking forward at Visme? That’s it you have successfully created an account with Visme. Next, we will see how to create Graphic Images at Visme. As soon as you enter Visme after account creation, you would have been brought to this page, which allows you to choose what type of Graphic content you want to create now. And for each of these Graphic Type, you have a lot of templates available. Choose any one template. If the templates available are not relevant to what you are looking for, no issues. You can choose the blank one and start from scratch. Once you have chosen the template, you will be taken to the Visual Editor page. Media: The Media section allows you to add video and audio to the project. You can also embed any online content. Theme Colors: This section shows you a list of theme colors. My Files: The My Files section allows you to add media. The center of the Editor is where you create your image. Once, you have completed the Graphic content, you can click the “Download” Button. Now, you can choose the format in which you want to download the graphics like JPG, PNG, PDF, PPTX, and HTML5. I would like to show you some Infographics making videos that I created for OnlineRockersHub with Visme. Though there are so many good features available at Visme, I used to notice a small error while downloading the image. When I type the last line of text, the editor screen shows it in a single line, but while downloading the image, the text would have been wrapped to the next line. The following image shows you the text wrapped image. To set it right, you just need to extend the text box length. I guess, this is a small issue that Visme will fix it up soon. 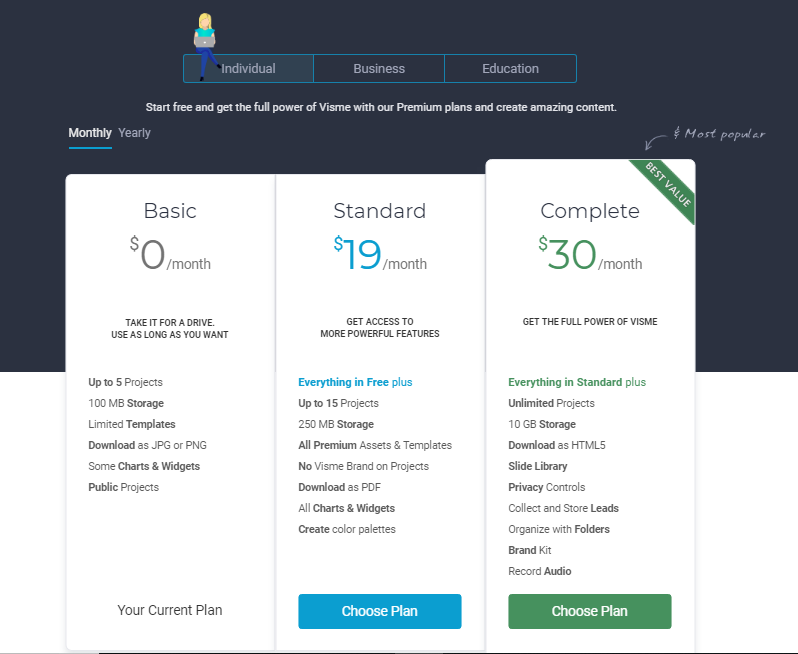 Visme has three different types of Pricing. The Basic package is completely free. However, it is limited to 5 Projects, 100 MB storage, Limited Templates. You can download your graphic only as JPG or PNG. Also, when you download your images with the Basic Package, they will have Visme Logo. If you want to remove the Visme Logo from your images, then you must upgrade to either Standard or Complete Membership. 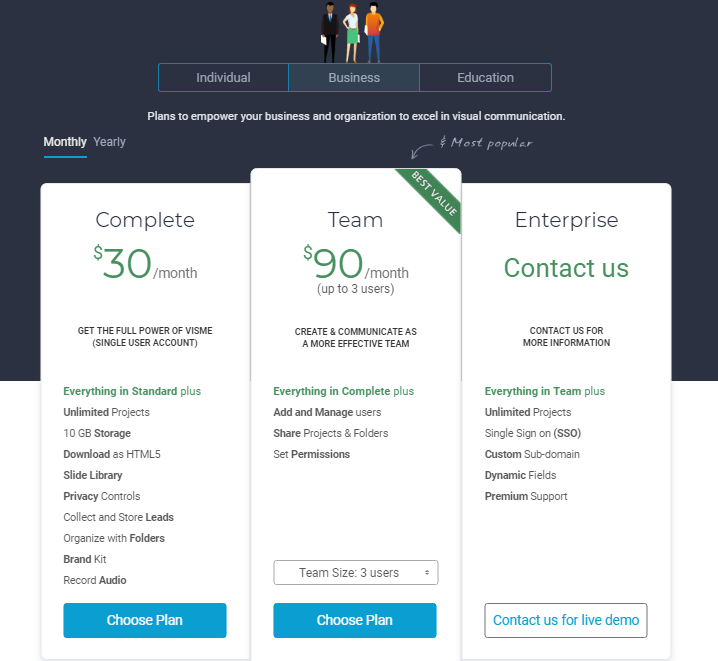 The Standard membership costs $19/month and the Complete membership costs $30/month. The complete membership allows you to create Unlimited Projects. They provide you with 10 GB storage and you have options to collect and store Leads. If you are a Business, then you must try out either Complete package or Team package. The Complete package will allow only one user to access your account. However, the Team package will allow up to 3 users to access your Visme account. If you want custom quotations, then you need to contact Visme for the Enterprise Package. 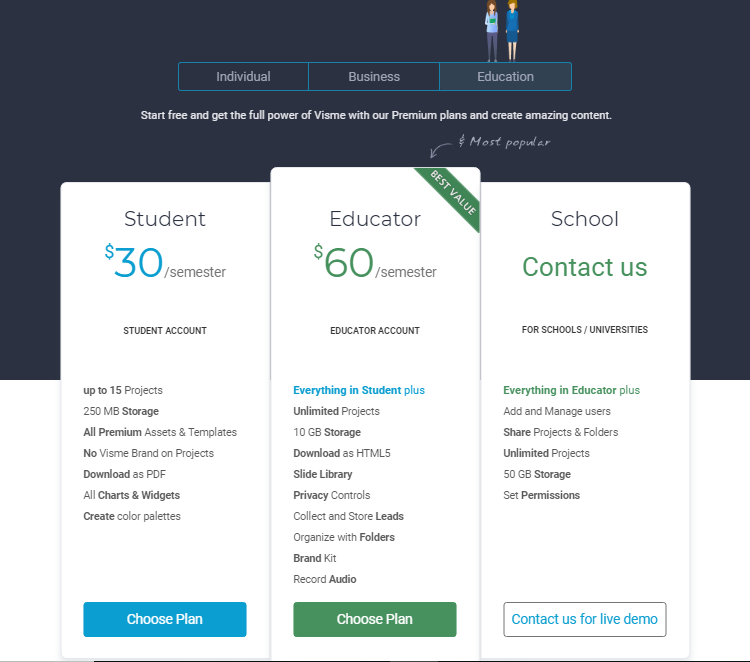 Probably Visme is the only Graphic Designer that I came across having memberships dedicated to Students and Schools. Unlike the other memberships which last for months, Visme’s Educational packages are calculated based on Semesters. The Student package will cost $30/semester and the Educator package will cost $60/semester. If you are representing a School, then you might need bulk access to Visme account. You can contact Visme for the pricing. 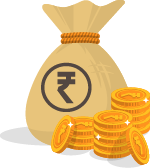 Apart from creating graphic images, Visme provides you an opportunity to earn money. You can make use of the Visme Affiliate Program. When you refer customers to Visme, you will get 30% recurring commissions. What do you mean by recurring commission? As long as the customer you referred renews his Visme membership, you will be earning commissions for it. So, if you refer a lifelong customer, you will be earning lifelong commissions. Visme is a freemium Graphic Designer Tool with a lot of good templates. Visme is suitable for creating Presentations, Infographics, Web Graphics, Social Graphics, Charts, Reports etc. 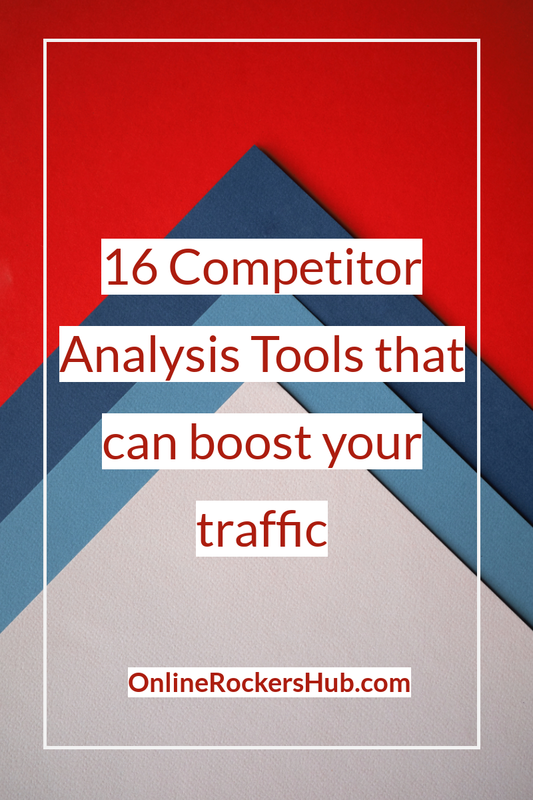 I prefer Visme for creating Infographics as it cuts down time with so many templates available. I have heard a lot about “Visme” infographic creator, but haven’t tried yet. I usually use software like Photoshop and illustrator to create infographics. Today, there are lots of online tools available which helps in creating infographics in an easier way. But, we must have right tool in our pouch that can fulfill our needs. 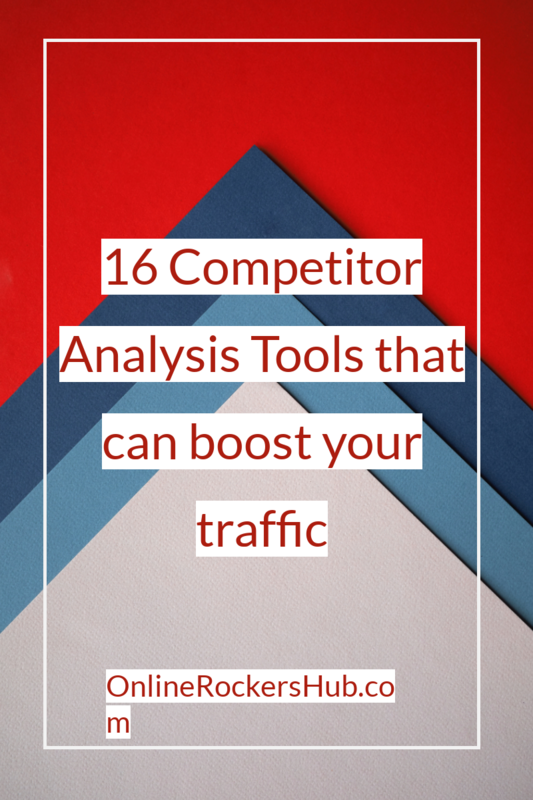 The features of the visme infographic creator are awesome and the price is also affordable. I am very excited to use this tool. I have also used Photoshop and Illustrator. But, I am a complete beginner in it. I need to learn to use those tools. These online Infographic creators would be very much useful for people who find it difficult to use these professional Image Editing software. I will have a look into my posts again. I use Grammarly to avoid grammatical mistakes and misspellings. Anyways, I will check once again.